SELMA is a powerful movie on Martin Luther King Jr’s march on Selma, Alabama for voting rights for African Americans. 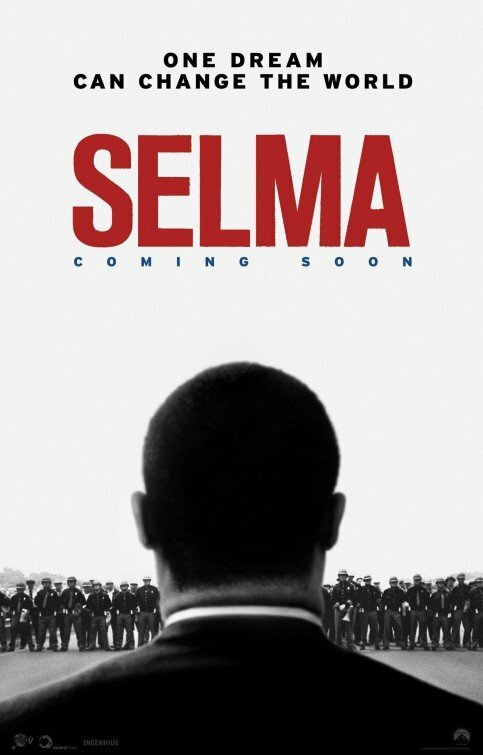 SELMA is a well-done movie with overt Christian, moral content, but it does have some intense violence and a significant amount of foul language, so strong caution is advised. SELMA is a powerful movie on Martin Luther King, Jr.’s marches from Selma to Montgomery, Alabama for voting rights for African Americans. SELMA is well done, with strong Christian, moral content, but it does have some intense violence and a significant amount of foul language. In October 1964, the Rev. Martin Luther King receives the Nobel Peace Prize. The 1964 Civil Rights Act has outlawed segregation in all 50 states, but African Americans are still having trouble voting in Alabama. So, when Annie Lee Cooper (played by Oprah Winfrey) goes to register to vote at the county courthouse in Selma in January 1965, she is denied that right. The sheriff pokes her in the neck with his club. She punches the sheriff and is arrested. Meanwhile, King believes that the right to vote should be the civil rights movement’s next fight. He goes to President Lyndon Johnson to plead with him that he must ensure the right to vote for all Americans, but Johnson says he has many other things on his plate. So, Johnson puts a voting rights bill on the back burner. King can’t let this happen. So, he goes to the Southern Christian Leadership Conference (SCLC) to make an official statement urging the country to ensure the right to vote. At Brown Chapel in Selma, King preaches that God created all people equally in His image. In the audience are the leaders of the Student Nonviolent Coordinating Committee (SNCC), who have been fighting for the right to vote in Alabama. Even though they feel like they are making a dent on the issue, King tells them they must push harder in order to make the change. After the sermon, King, the SCLC and the SNCC get together to strategize on the best way to make a bold statement about the right to vote. They decide they will march in March of 1965 from Selma, Alabama to the state capitol in Montgomery. The first march turns out to be violent. As the marchers advance, Alabama State Troopers viciously attack the crowd of marchers. This leads to national press coverage. With the stakes high, his marriage failing and President Johnson still not budging, King must decide if they should do another march. Before the second march, King’s wife confronts him about an illicit affair he’s having with another woman. King must spend time with his family to try to work things out, while the second march is gearing up. Again, the marchers are confronted by state troopers and police, but King orders the marchers back to the church where they started, where he gives a rousing speech. By this time, the nation is outraged by the treatment of the Alabama authorities of the marchers. So, President Johnson orders the Army and the National Guard to accompany and protect the marchers all the way to the state capitol, where the Rev. King gives another rousing speech. Meanwhile, Johnson has also introduced the Voting Rights Act, and it passes shortly thereafter. SELMA is an excellent movie. The acting is very good. David Oyelowo does a good job playing Martin Luther King Jr. Also, Carmen Ejogo does a wonderful job playing his wife, Coretta Scott King. However, the movie is very serious and intense, without any lighter elements to let the audience breathe. That said, SELMA has a strong Christian, moral worldview with prayer, church scenes, gospel songs, and Scripture quoted. Christian clergy and Christian laypeople are seen as the ones who step in and help take action to create positive social change regarding the right to vote. The movie also stresses that God created us all equal in His image. The movie also shows the truth about Martin Luther King’s adulterous behavior with different women while being married with children. The movie shows that these affairs had a negative effect on his relationship with his wife and other negative consequences. Nothing is shown, however, only implied. In contrast to this, the violence depicted in the movie is intense, showing the state troopers beating and killing people (reportedly, three people died in the 1965 marches). Because of the violence and a bit too much foul language, MOVIEGUIDE® advises strong caution. (CC, BB, PP, Pa, LL, VV, S, A, M) Strong Christian, moral worldview about the right to vote with scripture, prayer, church scenes, gospel songs sung, a positive representation of clergy, cross, clergy talking about the works of the Holy Spirit, with some light pagan elements where illicit affairs are mentioned but repercussions shown; 19 obscenities (including one “f” word), two strong profanities using Jesus and four light profanities; strong violence includes men whip people, beating, men shoot and kill other men, people beaten down, man beaten and killed, child killed by bombing, women hits man, man hits main character; implied sexual affair, with sounds heard but not seen, middle finger; light drinking; no smoking or drug use; and, police brutality and racism but rebuked. SELMA is a powerful movie about the Rev. Martin Luther King, Jr.’s 1965 march on Montgomery, Alabama for voting rights for African Americans. The 1964 Civil Rights Act outlawed segregation in the United States. When a woman tries to register to vote in Selma, she’s denied and arrested after punching the sheriff who poked her with his billy club. King decides the right to vote should be the civil rights movement’s next battle, but President Lyndon Johnson puts the issue on the back burner. So, King, with some other leaders, leads a march from Selma to the state capitol in Montgomery. SELMA is very well done. The acting is excellent. The movie is very serious, however, and doesn’t offer any lighter content to relieve the tensions. That said, SELMA has a strong Christian worldview with prayer, church scenes, gospel songs, and scripture. Christian clergy and church members are the heroes. The movie also says God created us all equal in His image. MOVIEGUIDE® advises strong caution for SELMA due to significant foul language, intense violence and references to King’s multiple adulterous affairs.